A ground control point (GCP) is a point of known coordinates in the area of interest. Its coordinates have been measured with traditional surveying methods or have been obtained by other sources (LiDAR, older maps of the area, web map service). 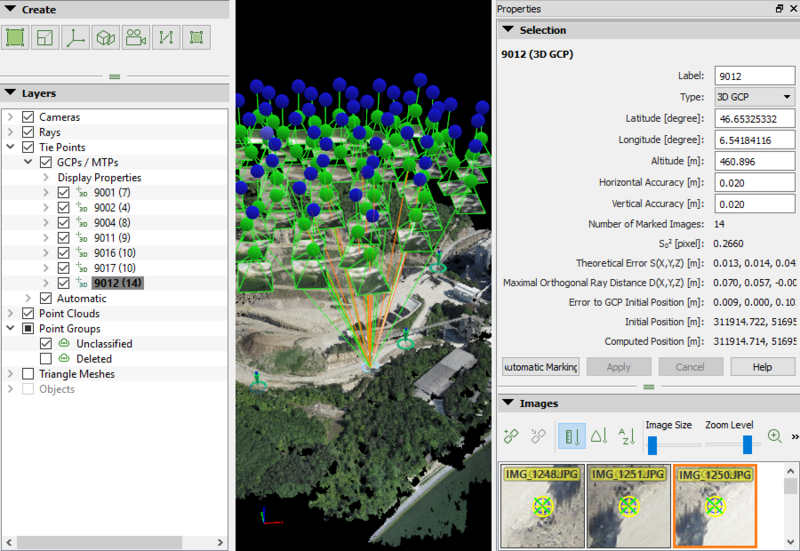 Ground control points can be used in Pix4D Desktop to increase the absolute accuracy of the project. The following step-by-step instructions are part of the whole procedure of how to include GCPs in the project. For more information about how to include GCPs in the project: 202560239. All GCPs must be in the same coordinate system. 1. Using the GCP/MTP Manager: before running step 1. Initial Processing. 2. Select the GCP coordinate system: By default, the GCP coordinate system will be the same as the Output/GCP Coordinate System selected when creating the project: Step 2. Creating a Project. 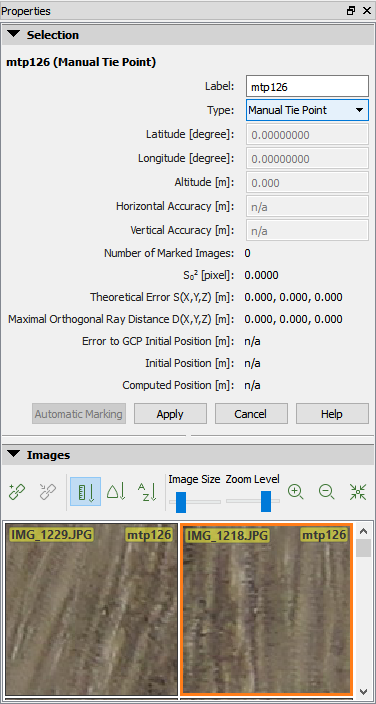 If the GCPs have a different coordinate system, select the correct coordinate system: How to select / change the Image / GCP / Output Coordinate System. Manually: Import the GCPs one by one. From file: Import all GCPs together from a GCP file readable by Pix4Dmapper. 1. 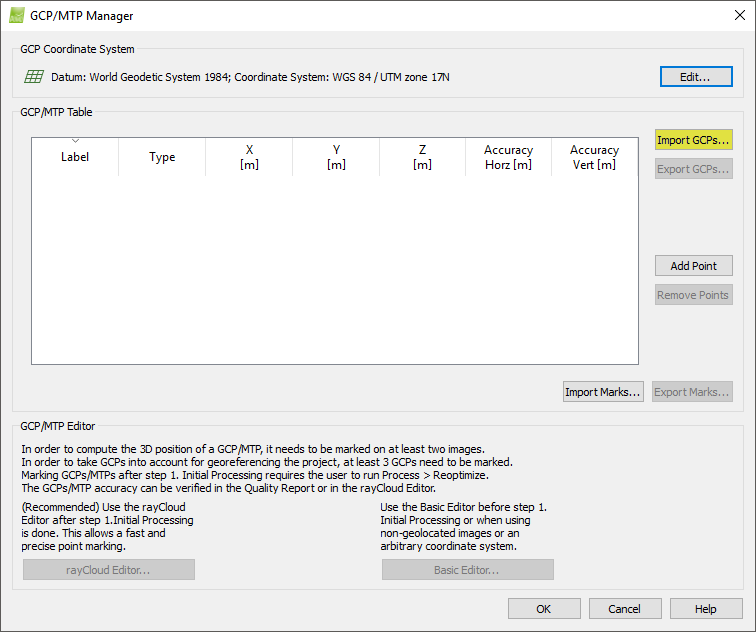 On the GCP/MTP Manager, click Add Point. A new point is added on the GCP/MTP Table. This point is defined by default as Manual Tie Point (Type column) and is named by default mtp1 (Label column). When adding more Manual Tie Points, they will be named mtp2, mtp3, etc. 1. Double click the Label cell of the point. 2. Type the desired name. 1. Double click the Type cell of the point. 2D GCP: if only the X,Y or Latitude,Longitude coordinates of the GCP are known. 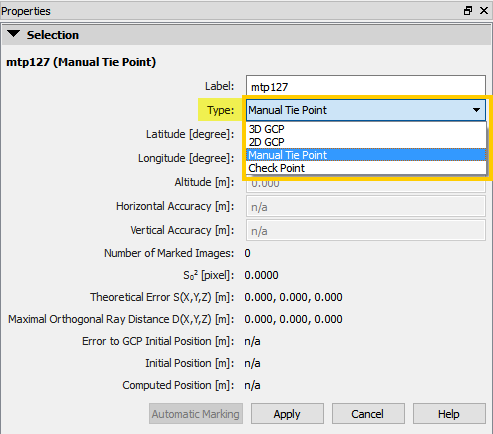 3D GCP: if the X,Y,Z or Latitude, Longitude, Altitude coordinates of the GCP are known. Check Point: if the X,Y,Z or Latitude, Longitude, Altitude coordinates of the GCP are known. A Check Point is not used in the reconstruction and indicates the accuracy around the areas where it is defined. 1. Double click the coordinates cells of the point (X,Y,Z or Latitude, Longitude, Altitude). 2. Type the corresponding coordinates. Warning: The default value is 0.020 m, DO NOT modify the accuracy, unless the following article is read: GCP / Manual Tie Point Table. 1. Double click the Accuracy Horz/Vert cell of the point. For very accurate GCP, insert a low Accuracy value. For non accurate GCP, insert a high Accuracy value. For more information about the GCP table properties: GCP / Manual Tie Point Table. 3. Repeat steps 1 and 2 for the rest of the GCPs. 4. On the GCP/MTP Manager window, click OK.
1. Make sure that the GCP file has the correct input file format. For more information about the file format: Input files. The Import Ground Control Points pop-up appears. 3. (optional) Select the Coordinates Order: By default, X, Y, Z (Latitude, Longitude, Altitude) is selected. It is possible to change to Y ,X, Z (Longitude, Latitude, Altitude). For more information: Input files. 4. Click Browse... to navigate to the GCP file. 5. Select the GCP file. 1. Double click on the Accuracy Horz/Vert cell of the point. 9. On the GCP/MTP Manager window, click OK.
2. Using the rayCloud: after step 1. Initial Processing has been completed. 2. Select the GCP Coordinate System: How to select / change the Image / GCP / Output Coordinate System. 3. Open the rayCloud: From the Menu bar, click View > rayCloud. The rayCloud opens and the Automatic Tie Points appear. 4. 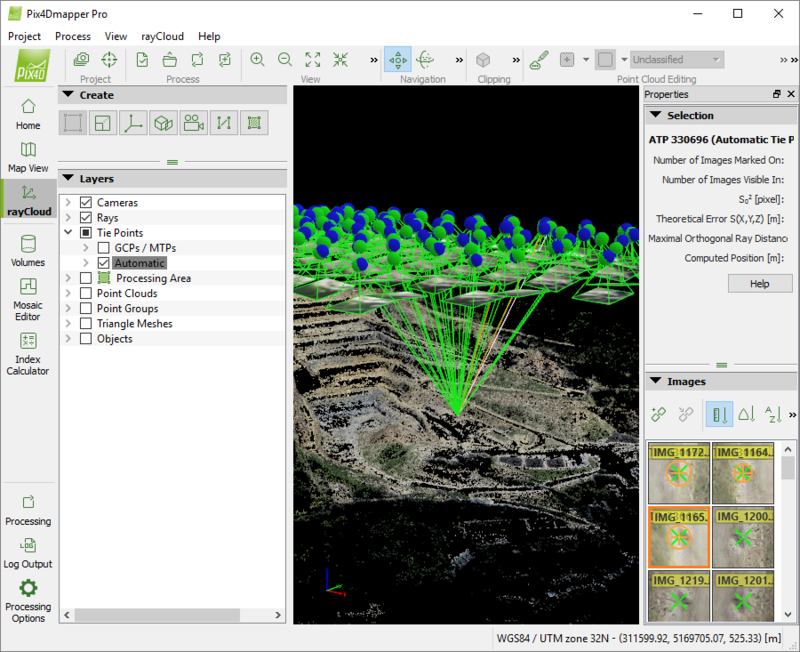 On the 3D View, click on one point that approaches the GCP position. On the right sidebar, the Images section displays all the images on which the clicked (selected) point is visible. Green cross: Reprojection of the 3D point on the images. Orange cross: Position where the associated 2D keypoints have been automatically detected. Orange circle: The radius of the orange circle indicates the size of the area that has been taken into account to detect the keypoint. 5. On the right sidebar, in the Images section, the GCP area should appear in the displayed images. 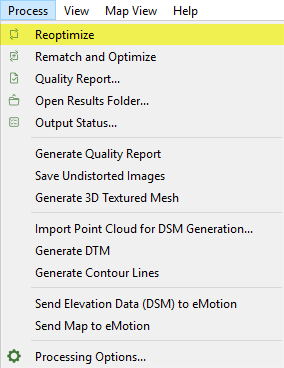 If not, click another point on the 3D View that approaches better the GCP area. 6. Click New Tie Point. 1. Click the Label cell of the point. Check Point: If the X,Y,Z or Latitude, Longitude, Altitude coordinates of the GCP are known. A Check point is not taken into account during processing and indicates the accuracy around the areas where it is defined. 1. Click the coordinates cells of the point (Latitude, Longitude, Altitude or X,Y,Z). Warning: The default value is 0.020 m, DO NOT modify the accuracy unless you have read: GCP / Manual Tie Point Table. 1. Click the Horizontal Accuracy / Vertical Accuracy cell of the point. 9. Repeat steps 4 to 8 for other GCPs. 1. Using the rayCloud: when GCPs refer to a known coordinate system and after step 1. Initial Processing has been completed. 10. When all GCPs are marked on the images, click Process >Reoptimize. This reoptimizes the reconstruction using the GCPs. 11. (optional) To Generate a new Quality Report, click Process >Generate Quality Report. 2. Using the Basic GCP/MTP Editor: when the GCPs coordinate system is Arbitrary or before running step 1. Initial Processing. 2. On the GCP/MTP Manager, click Basic Editor..., the Basic GCP/MTP Point Editor window appears. 3. On the GCP/MTP Table, select the GCP to be marked. By name: The images are sorted alphabetically. 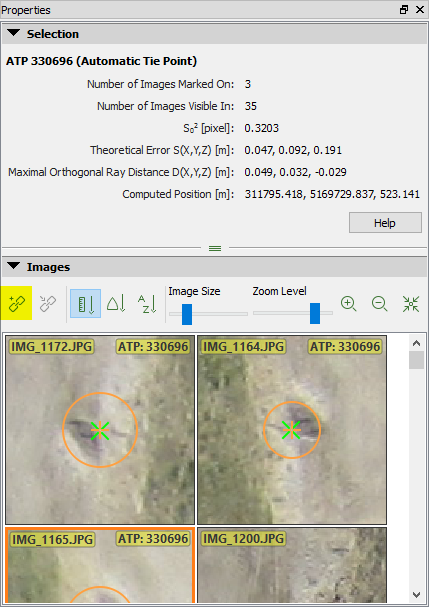 By Distance to GCP: Images closer to the GCP are listed first. 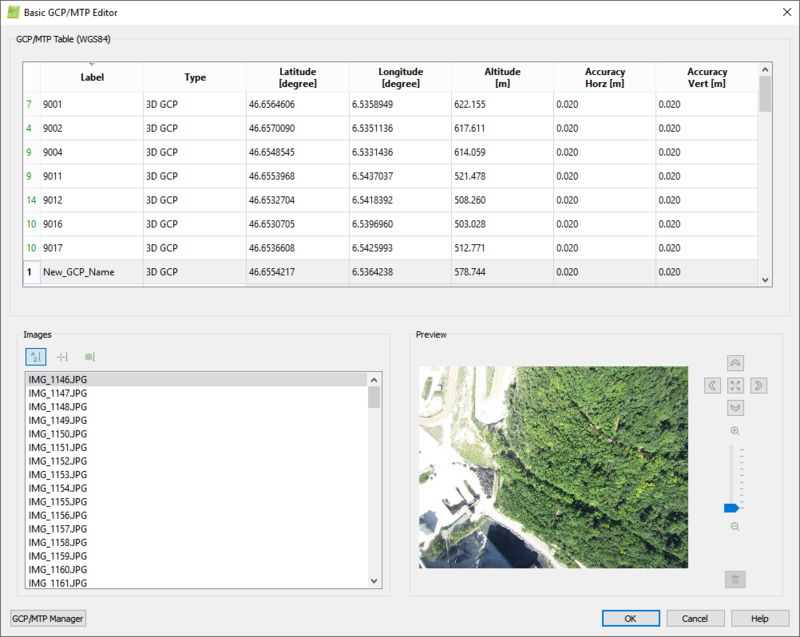 This sorting can be used only if the images and GCPs are geolocated using a known coordinate system. This is the default sorting mode. By Distance to the Marked Image: When an image is selected and a GCP is marked on it, this option lists the images that are closer to the currently selected image. This sorting can be used only if the images are geolocated. 5. On the Images section, select the image on which the GCP should be marked. After the selection, the image is displayed in the Preview section. Pan: Using the mouse left click. Zoom in quickly on a specific point in the image: point with the mouse the point and press the Alt key. When the key is released, the view returns to the last zoom level. Zoom out to preview the zero zoom level: Press the Shift key. When the key is released, the view returns to the last zoom level. 7. Left click on the image to mark the point. 8. (optional) If it is needed to remove a mark, click Remove. 9. On the Images section, select the next image on which the GCP should be marked. Note: A GCP does not need to be identified / marked on all images in which it appears. Ideally, mark a GCP on 3 to 8 images (the minimum number of images is 2). 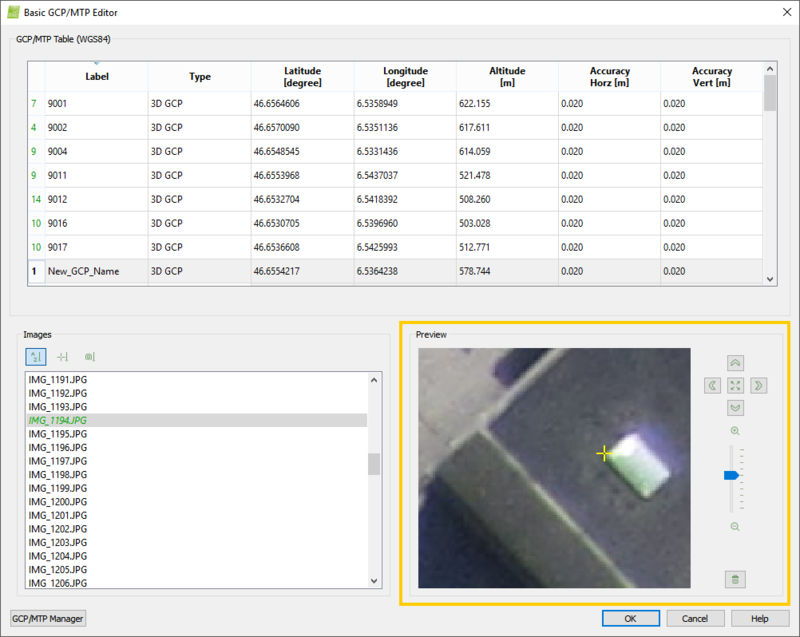 The Quality Report after step 1.Initial Processing indicates if it is needed to mark the GCP on more images. 10. Repeat steps 5 to 9 for other GCPs. A minimum number of 3 GCPs is required but we recommend including at least 5 to 10 GCPs. When the topography of the area is complex adding more GCPs could lead to a more accurate reconstruction. Is it possible to process a project that contains GCPs on the ground around a building and also GCPs on the side/facade of the building? I wish to take a series of photos at oblique angles and several heights in order to later create an orthomosaic facade but I want to be sure that we can use targets on the side of the building with known coordinates in the processing part of the project. Thank you.